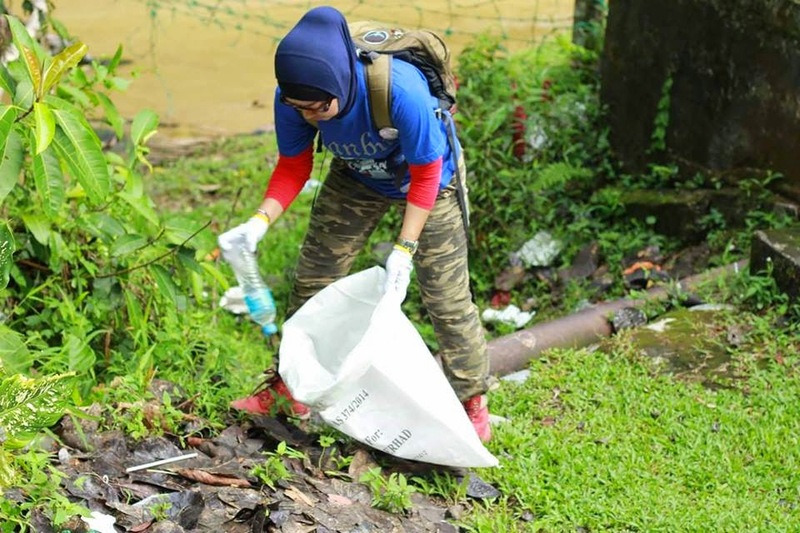 The Green Living SIG subcommittee coordinated a cleanup programme at the Ampang Recreational Forest on 25 April 2015 in conjunction with Earth Day to encourage urban dwellers and nature enthusiasts to be stewards of green spaces. The Earth Day weekend was the perfect opportunity to get members of the community involved in cleaning up a popular recreational forest without leaving town. Leave No Trace Malaysia, a local chapter of an international initiative to leave environmentally-sensitive sites litter-free, collaborated with us and made a generous offer to sponsor prizes for a contest we would be organising on that day. 4. A large bottle of drinking water for refilling everyone's water bottles with, and bananas and oranges for a waste-free breakfast. The photo contest and zero-waste breakfast constituted the 'goodies' for our 15 cleanup participants in lieu of wasteful goodie bags and t-shirts, as everyone agreed that the focus should be on protecting the environment and reducing waste. 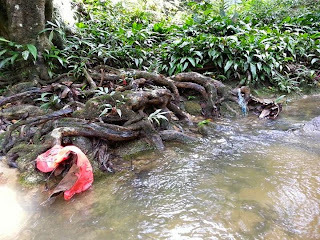 The cleanup session was kicked off after a basic safety briefing and a signature campaign to object to the EKVE and save the Ampang Forest by TREES (Treat Every Environment Special Sdn Bhd). Our plan was to walk to the picnic site first and clean the recreational forest from the inside out, instead of dragging heavy bags of litter into the picnic area and back out again. Dee Lu of Corezone Malaysia joined us at this point and we were grateful for her help in transporting the rubbish out with her pickup truck. 1. 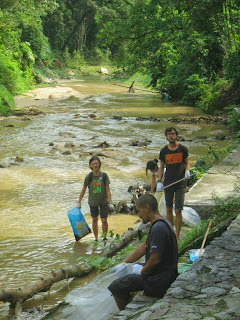 Volunteers waded into the stream, went behind scratchy bushes and climbed up hill slopes in order to pick up litter left behind by irresponsible picnickers. 2. Annieson spotted a sarong in the stream. I hope this doesn't mean that someone went home naked. How could you forget a sarong? 3. Herlinde of Yellow House KL found a bucket in perfect condition, as well as some plastic bags. 4. Jon found a TV remote control in the stream. Did someone decide to take their TV along on a picnic? 5. Our hardworking volunteers removed litter chucked carelessly behind bushes, probably by the local council contractors who do not know any better. 6. 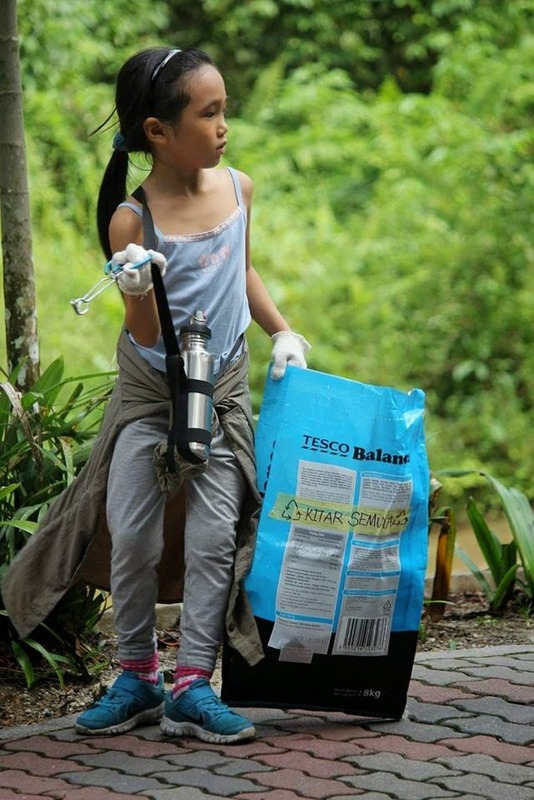 Our youngest participant, Zhang Hui, worked hard at removing cigarette butts and sweet wrappers using her steel tongs. 7. Never underestimate the power of small groups of committed and enthusiastic individuals in changing the world for the better! - To reduce unnecessary purchases, especially of unnecessary items that come in non-biodegradable packaging, e.g. sweets and junk food. - To bring your own reusable food containers, cloth shopping bags and refillable water bottles whenever you leave the house. - To bring rubbish bags along on picnics and nature trails in order that you can clean up after yourselves and others and take your rubbish out with you. 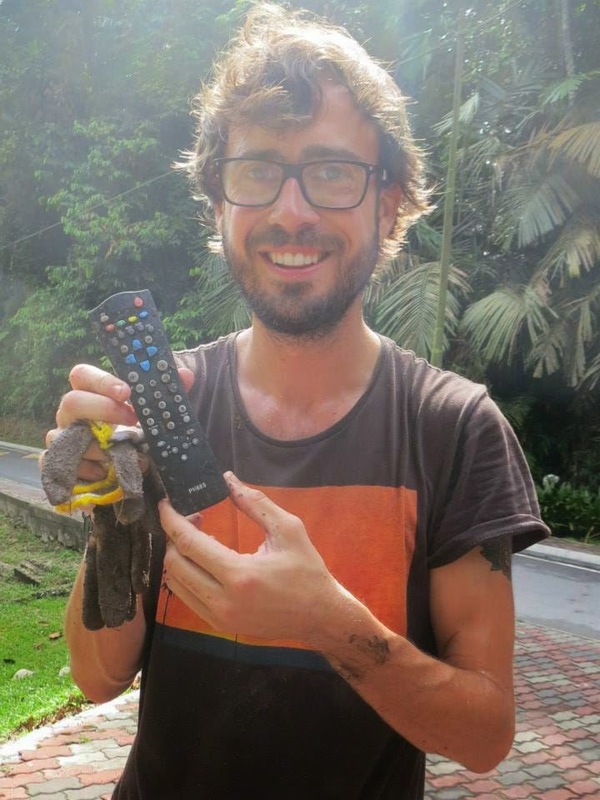 Following this cleanup session, Green Living also intends to contact the local council to discuss the issue of cleaning contractors dumping rubbish into the bushes, and the lack of macaque-proof rubbish bins in a recreational forest overrun by macaques. We had to transport all the rubbish out to a nearby apartment complex for proper disposal, and the recyclables were later transported to a recycling centre. The breakfast fruits were duly handed out, and Green Living merchandise (booklets and stickers) distributed to volunteers upon request. 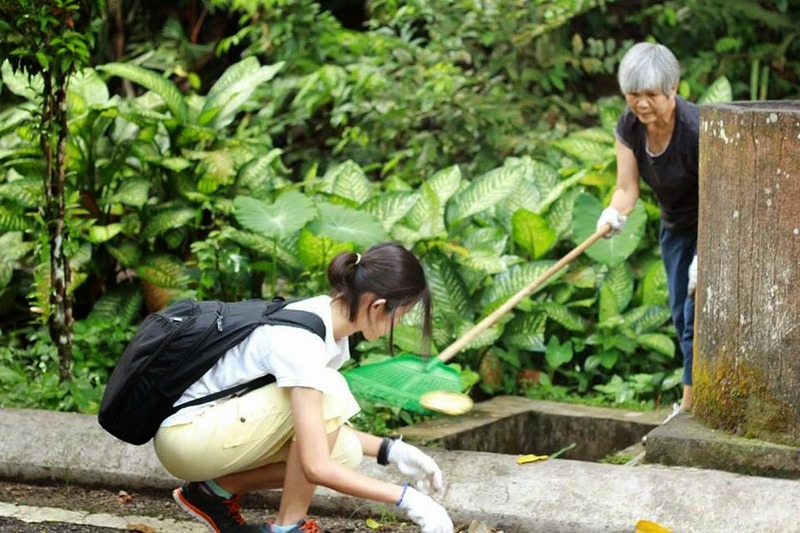 Green Living would like to thank all the dedicated volunteers who braved the heat, humidity, dirt, mosquitoes and leeches to clean up our little piece of the world. Little things done with great love can and do make a huge difference.